Tomatoes that taste like tomatoes. Apparently, the farmers around Putnam County, West Virginia, where my Mom and Dad live have taken to growing tomatoes that are perfectly round, beautifully red, and look lovely, but which have the texture of styrofoam and the flavor of, well, wet styrofoam. It sounds to me like these farmers have taken to growing tomatoes meant for the wholesale grocery store trade, which means they look pretty on the shelves, and are a uniform color, size and shape, and have no smell, flavor or texture to speak of. 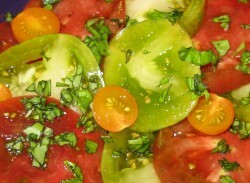 Luckily, the farmers here in Athens have learned the cure for the market tomato blahs–heirloom tomatoes. Now, I have written aboutthese lovelies before—several times–but this time, I wanted to evangelize a little bit, just as I did with my parents. Aren’t those sliced tomatoes beautiful? They look like gemstones, shimmering in the sunlight. Three varieties of tomato are represented there: Green Zebra, Cherokee Purple and Sungold. I will let you guess which is which, since the colors of the tomatoes are mentioned in their names. Not one of them is the typical scarlet red of the tomatoes in the produce section of your local supermarket, and the Cherokee Purples are definitely a different shape. But who cares, when you can smell their delicious fragrances as soon as you slice into them? Look at how juicy they are? They are bursting with juice, life and goodness–and you can just see it. Imagine if you could taste it–the earthy sweetness of the Cherokee Purple, the tangy zing of Green Zebra and the honey-tinged richness of Sungold. These are the tomatoes I introduced my parents to the last time they were here. And these are the types of tomatoes I wish I could serve to everyone in America, just so they know what tomatoes are supposed to taste like. Heck, why stop at America? I wish I could personally slice up a tomato for everyone on earth, and serve it to them simply, like these pretties, with a sprinkling of fresh basil (grown up on my deck garden) and a little shake of pure sea salt. I think that if people could just taste these gems from the garden, there would be a tomato revolution. People would want that taste again and again, and would be willing to do what it would take to get it, whether it was shop at a farmer’s market, insist upon local tomatoes being sold in local supermarkets, grow them in a community garden or get them at a local restaurant. I’d love to see people stop buying the supposedly “fresh” tomatoes at the grocery store. The truth is, I haven’t bought one in years. I just don’t eat fresh tomatoes when they aren’t in season. I eat them canned, in juice, in sauces, dried and pureed, but not fresh. There just isn’t any point. Those red baseball sized “tomatoes” in the grocery store just don’t taste like anything. Who knows how long they have been off the vine, and who knows how many vitamins or minerals are left in their crisp, nearly juiceless flesh? They just are not worth the bother or the price. Nope, it is all about the seasonal, home-grown, freshly picked tomatoes. They are where its at. And I am so there. I feel the same way. We didn’t buy but maybe 2 fresh tomatoes from the grocery store this entire year, holding out for our homegrown heirloom tomatoes. It was worth it. I know this is heretical, but I don’t find the heirloom tomatoes from my farmer’s market that flavorful either… although they are surely better than wet styrofoam. 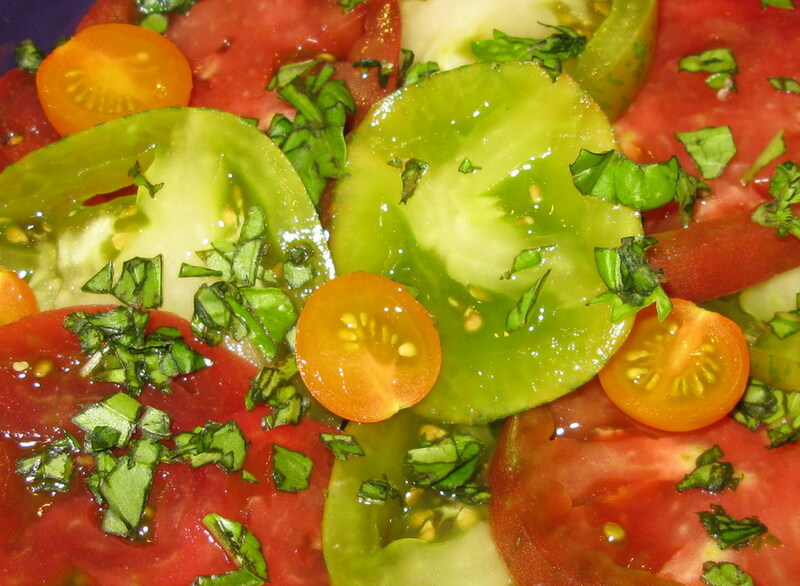 Many of them have a lovely, delicate, not very tomato-y flavor… especially the yellow, green, and brown tomatoes. The grape tomatoes have been amazing. But I haven’t had that quintessential tomato taste this summer. Mmm, I love tomatoes. Next year I’m growing the heirloom kind so I can save the seed. Yum. 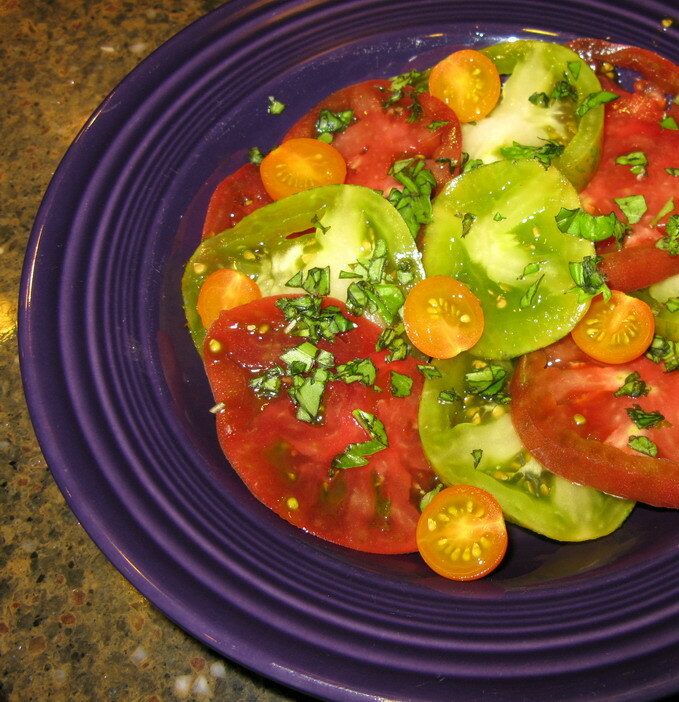 I didn’t like tomatoes until I started buying heirlooms at farmer’s markets or roadside stands. Now, if it’s not summertime (or I can tell that the tomato is subpar), I generally pick them off of dishes in restaurants and never buy them in stores. They’re just so much better locally grown and in season! My winter savior is canned plum tomatoes made into bruschetta, or sundried tomatoes in pasta. I rarely touch the fresh ones in winter, though sometimes I’ll use grape tomatoes. You’ve inspired me to go and speak to the next place that I go to around here that tries to serve me a styrofoam tomato in the height of CA tomato season. This has happened to me several times recently and is SO disappointing because I know how great tomatoes can be. I’ve been loving the variety I can get, green, yellow, orange, red, and purple! It really surprises me after discovering just how easy it is to grow tomatoes (I was helped along by a volunteer tomato plant in my front yard last yer) that anyone would grow bland tomatoes. Maybe I’m just lucky, but I consider myself the queen of garden neglect. The only reason I don’t pull out my tomato plants when they look like they’re not going to produce is because I haven’t “gotten to it” yet, and then wham! One day there are dozens of ripe red beauties and I don’t know what to do with them all. I hope your parents can find some good tomatoes — or grow some good ones — next summer. A gift of pure love being given a basket of home grown, just picked off the vine tomatoes. I don’t need anything more – not even salt. I sat on the step, basket in lap, eating such delights. Pure heaven! Growing up, my mom (and Granny) always grew their own tomatoes (they swore by tomato + black pepper +mayo sandwiches over the sink, but I couldn’t fathom it as a kid). I’m sure that we did, at least once, but I don’t have a single memory of buying store bought “fresh” tomatoes. Unfortunately, store bought “fresh tomatoes”– wet styrofoam is the perfect description– is the food texture phobia I have of eating raw tomatoes. I just moved to a new apartment right next to the farmer’s market, though, so I think next week, with newfound confidence from your blog, will be the week of no-more-tomato-fears! Here Here! This year I grew my own heirlooms, starting from seed, and the results are soo much better than I ever could have imagined. The green zebras are definitelt one of my new favorites. If you see them anywhere, try out the German Red Strawberry tomato- they’re shaped like giant strawberries and so dense and fruity… Holy yum batman! I think it also varies by variety. I grew three kinds this year. One is out-of-this world yummy. One is OK. And one – well, it sort of tastes like wet styrafoam, although it is big and prettier than the others. So locally-grown doesn’t necessarily mean great. Love Cherokee Purple. Grew them this year as well as lots of yellow pear, grape tomatoes, and a few others. Now that I have a deer fence to keep out my golden retrievers, we can enjoy lots of home grown tomatoes! Thanks for this! I grow all colors, all shapes, but ONLY ones I like eating fresh. And those are the same ones we preserve by canning. I never understand why people choose varieties to can that they don’t like eating fresh: sure, they’re meatier and less seedy, but that’s a poor replacement for great tomatoeyness. (My quart jars of tomatoes look, shall we say, interesting… greens, purples, pinks, oranges.) I have to admit that canning the interestingly shaped ones like Kellogg’s Breakfast and Aunt Ruby’s German Green is a bit of a pain, but there are also lovely tasting tomatoes that are easily canned (slip out of their skins, uniform shape, no catfacing) like Cherokee Purple, Tappy’s Heritage, Eva Purple Ball, and Marglobe. Yum. I judge every tomato by a tomato, onion and blood orange salad my grandomother made for us in Spain. I was probably 12 years old and not a big tomato fan at the time. But what she served us was nothing more than large wedges of tomato with large wedges of onion and blood orange slices. Dressed in olive oil salt pepper and blood orange juice(and of course a grandmothers love!) To this day still the most outstanding tomato dish I have ever had. You’re certainly preaching to the choir here. But I’d just like to raise my glass to your sentiments. I’d never been a big tomato fan until I came down to Virginia to work on a farm. Of course there must be people growing delicious heirloom tomatoes in NE Ohio,but foolish me never knew to seek them out because tomatoes? meh. Now that I’ve tasted tomato heaven I’ll never go back and I’ll tell it to anyone who will listen. Ugly delicious tomatoes are the only way to go for a myriad of reasons. Cherokees and persimmons are our faves. But, my tomato salad is best with a variety including pinks, reds and our green zebras aren’t ready yet, but I can’t wait until they are! Thanks for the inspiration and keep up the good work, sharing the good food word! The true crime is that Whole Foods is selling non-local “heirlooms” –California tomatoes sold in Atlanta, GA right in the peak local tomato season — that taste like the mealy grocery store variety. A travesty. I learned that lesson quickly though – if it’s in season in GA, I will seek out the local sources. I found your website while looking for a ‘real’ recipe for char sui pork a few months ago and I wanted to take the time to tell you how great your blog is. I am a major asian foodie and spend hours cooking asian foods. I am amazed at how much I have learned from your site. I really like the fact that you spend a great deal of time really explaining technique, traditions, etc. One thing that I am trying to perfect at home is a truly good vietnamese beef pho stock. I have made a version that is pretty close to some of the ones in restaurants, but I still am not quite satisfied. Any help from anyone on this would be great appreciated! I refuse to buy tomatoes, other than in season and locally, garden ripened. It’s just a waste of money waste of eating effort. I LOVE garden fresh tomatoes, the ones in the supermarket pale in comparison. I’ve just planted some tomatoes here in Houston. Hope it doesn’t freeze 🙂 Looking forward to homegrown tomatoes in May. loved your post and I totally agree on the taste of tomatoes.. and I love hierloom tomatoes..Ive taken to getting them from the local farm.. In 2010 we grew a few different varieties of tomatoes in urns on a back porch because of the poor soil quality in our community. When doing this you need to be sure the pots are big enough for respective plants potentiall root growth and you will probably need to water them almost double as much as the soil tends to dry out. Also just before they turn red either cover them or harvest them as birds will destroy your plants as they cant stay away from the bright colors.